With their Notice of Proposed Rulemaking this past summer, the federal agencies intensified the debate over an appropriate change, if any, in the appraisal exemption level as identified in the Interagency Appraisal and Evaluation Guidelines. The agencies proposed an increase in the current de minimus level, locked in at $250,000 for over 20 years, to $400,000 to provide commercial banks more flexibility in using commercial evaluations in lieu of appraisals with the primary intent to produce regulatory relief. The fulcrum of this initiative is the small balance commercial lending space that, according to our proprietary research, generated loan volume in excess of $200 billion in 2017 involving commercial and multifamily mortgages under $5 million in value. Because of Boxwood’s pre-eminent focus on this small commercial property and loan space, we surveyed our clients this past November about their reactions to and outlook for the proposed rule change. Nearly two-thirds of bank officers support the new rulemaking. Among those that supported the threshold increase, an overwhelming majority claim that their financial institution will see an upturn in small balance lending (SBL) volume and borrowers will also save on costs. 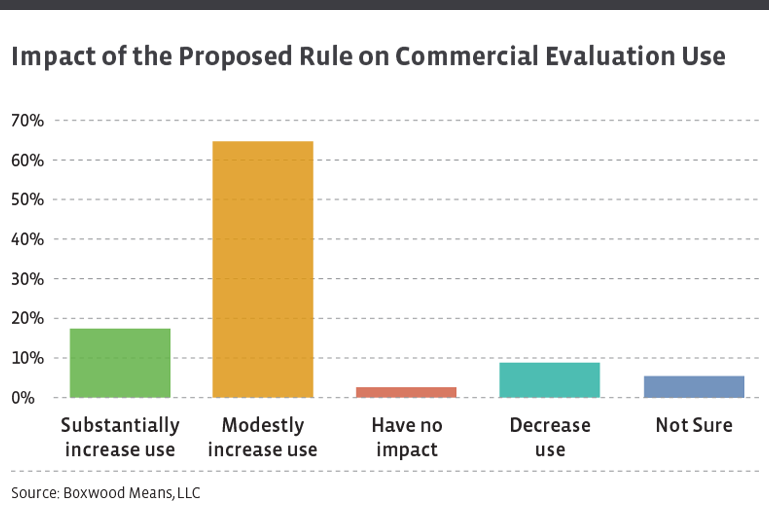 Over 80% of respondents will increase use of commercial evaluations. However, most bank officers expect to see only a modest rise in evaluations use, not an upsurge. A diversity of opinion prevails on using commercial evaluations on larger loan renewals. Almost half of the participants were comfortable employing evaluations on loan renewals and extensions amounting to $1 million or more involving a property with relatively low credit risk. But a sizable minority indicated they will play it more conservatively on loan renewals by restricting evaluation use at either the existing or proposed exemption level. Bankers project modest internal cost savings from the new rule. A majority anticipates some cost savings by replacing appraisals with commercial evaluations, but only a slim minority expect substantial savings to accrue. This latter finding runs afoul of the agencies’ expectations for “significant” cost savings by financial institutions. To be fair though, the agencies considered other factors like time savings in calculating their assessment of the level of potential cost reductions. Boxwood’s own assessment is that the promise of regulatory relief may be best achieved – and, importantly, on a recurring basis at that – if more financial institutions prudently relax restraints on commercial evaluation use with larger-sized renewal loans.